I’ll be looking at how Emre Can has gone from a future star, to a fan favourite, key player and potential captain in such a short space of time. 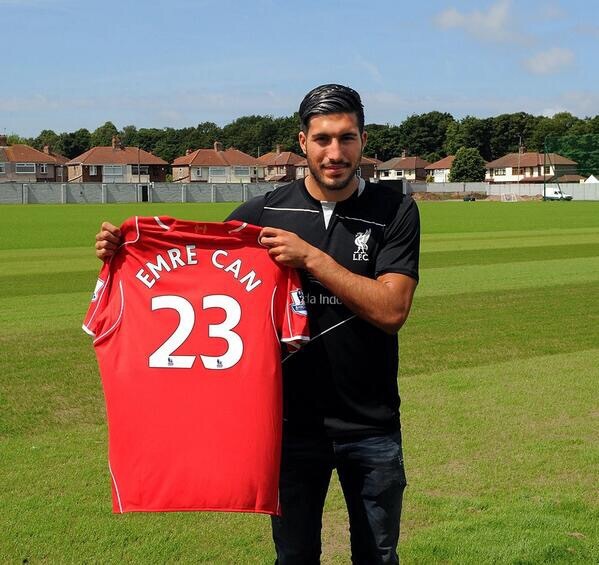 Emre Can: bought for ten million pounds from Bayern Leverkusen. Not much really to add, apart from he’s a young, talented, midfielder from Germany, who was given the iconic 23 carried by Jamie Carragher for many years. Fast forward one year and Liverpool supporters are considering him as the next captain. Given his time at Liverpool, he’s become a vital player for the club. His passion and desire has come across great with the supporters and is already a fan favourite. Watching him in the last few months under Jürgen Klopp, at just twenty two years old, you can see the talent and hard work he puts in for the team. His performances this season have also earned him a call up for Germany’s Euro Qualifiers against Poland and Scotland. Can’s brilliant season could have sadly ended after a potentially season ending injury against Dortmund. With scans showing Can had ruptured his ligaments, it looked like it was all over for Emre Can this season, and possibly for Germany at the Euros. This was a massive blow for club and country. Miraculously, a few weeks later, rumours were circulating that Emre Can could potentially be fit for the second leg semi final against Villereal! Yes, you read that correctly. After being told he was out for the rest of the season, Emre Can was now in contention to actually play again this season, with Villareal being his next game. You can just see how influential Can is to the team, and what a difference he makes when in the side. For Can to be brought back so soon after his injury also shows how much Jürgen Klopp admires him, and how important he is to this team. In a motivating interview with Can, he reveals he trained every day for three weeks. The determination to get back and help the team get into their first European final in nine years shows his character and professionalism which is needed to succeed at Liverpool Football Club. His comeback was exceptional. He played a massive part in the game and was a strong contender for man of the match. Can played the full ninety minutes of the game, and to come straight back and perform like that was simply outstanding. If that isn’t captain material, I don’t know what is. If by now you still haven’t grasped the idea of Emre Can, I’ll put it in a different context. If you compared Emre Can to a car, he would be a Rolls-Royce. An elegant, yet powerful engine which is very easy on the eye. The energy, passion and class that the 22-year-old brings to the Liverpool midfield is undeniable. Emre Can is maturing into one of the finest players at the club. Personally, I feel that Klopp should leave Can to develop without the pressure of wearing the armband. However, if he keeps this up and there is no doubt in my mind that he will wear the captains arm band very soon. You omit to talk about the fact that he has an ego the size of germany and believes his own hype, in addition to going hiding in games (re: Europa Cup Fianl second half). Once he sorts these elements out and just gets on with it, he may have a future. I also think he has the potential to be our captain. Yes he is raw. But wasn’t Gerrard when he was made captain at 23 yrs old. Not comparing the 2, but situations are similar.